Commercial hair dyes contain thousands of different chemicals, some of which are reported to be carcinogenic -- but you don’t have to choose between gorgeous colour and good health. 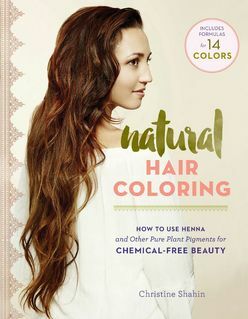 Hair care expert Christine Shahin shows you how to use nontoxic natural plant pigments -- henna, indigo, amla, and cassis -- to colour your hair naturally, and with beautiful results! These pigments are readily available at natural food stores and online; they’re simple, safe, and easy to use; and they cost much less than a trip to the salon. With clearly written instructions and step-by-step photography, Shahin shows you exactly how to apply these pigments, alone or in combinations, to achieve a full range of shades of brown, black, and red. She also includes instructions for transitioning from chemical dyes to natural ones and for using chemical and natural dyes together. While a vast majority of women colour their hair, many have reservations about using chemically laden dyes and are interested in safer alternatives. This book offers in-depth instuctions in using henna, indigo, amia, and cassia plant pigments to create stunning customised looks without the chemicals or the cost of dye.